When Hyundai announced that the 2013 Santa Fe would be two models, a two row seating version called the Santa Fe Sport, and a three row version called the “Santa Fe”, Torque News predicted we would see the Hyundai 2.0 Turbo engine move to the new platform. We were correct. However, although that engine makes a respectable 264 horsepower, family oriented customers and enthusiast alike know that you cannot beat a V6 for fuel economy and power in this size vehicle. 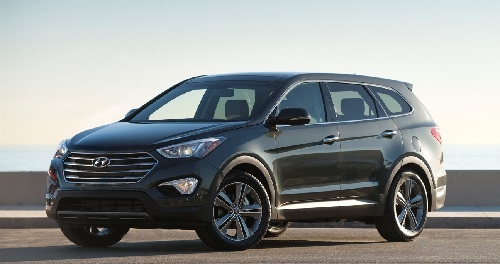 Hyundai has announced prices for the just released 3-row Santa Fe and in doing so also revealed that the highway fuel economy for the smaller 2.0 Turbo 2-row Santa Fe Sport (all-wheel drive) AWD is the same as the larger 3- row Santa Fe with AWD. Overall the difference is 1 mpg combined. The bigger vehicle with the larger engine gets the same highway mileage? Based on our analysis of the competition, the all-new 2013 Hyundai Sonata with three rows of seating and a powerful, fuel efficient V6 seems hard for customers to ignore. Always one of the company’s best-selling models, it appears Hyundai has another winner on its hands. This page is updated on April 1, 2013.